How are parents to know if their children’s attention and/or school struggles are related to poor vision skills? One way to determine if vision is playing a role is to evaluate their symptoms. Generally, we expect to see problems in reading (because of smaller print size) and attention (because of fatigue and eyestrain). Of course, related activities such as writing, homework, and test performance will also be difficult. 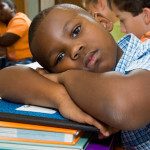 Research correlates common symptoms to the probability of a child having vision problems that impede school performance. 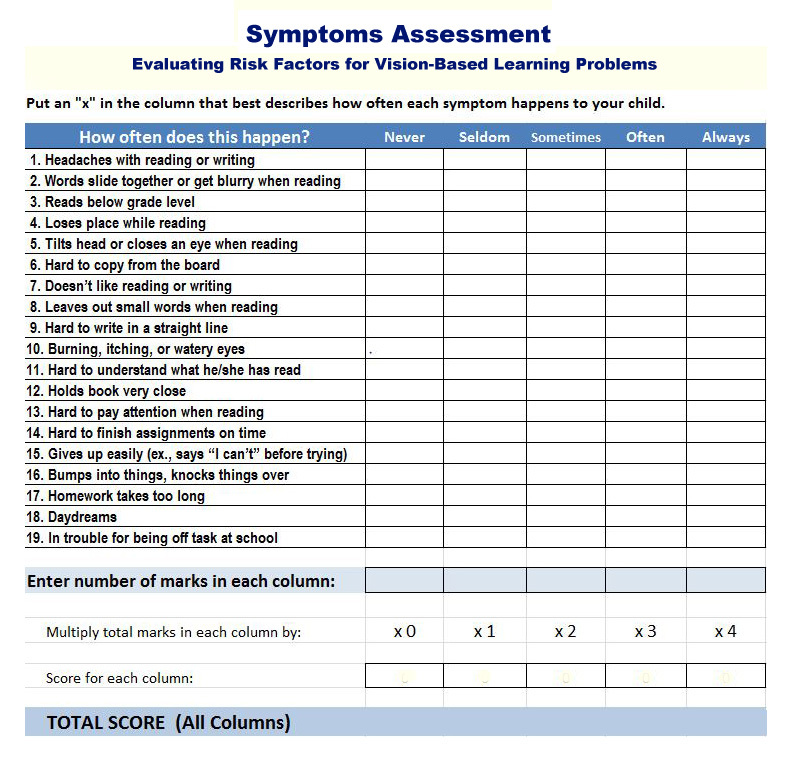 Below is a copy of a symptoms assessment (Quality of Life short form, College of Optometrists in Vision Development) shown to meet reliability standards as a valid tool to assess your child’s risk. * The assessment form asks you to evaluate to what extent your child exhibits common symptoms associated vision-based learning problems. Below are two links to printable versions for the assessment form–one in Excel that will automatically compute your child’s score, or if you don’t have Excel, one in Word on which you can manually add up your child’s score. Please fill out the form, quantifying how frequently you or your child’s teacher observes these symptoms. Then add up the total marks in each column, multiply by the column factor, and finally add up the totals from each column. The final score gives you a realistic measure of the chances that your child’s visual system is interfering with his/her ability to read, learn, and remain on task. The higher you rate your child’s symptoms above 20, the greater the likelihood that poor visual processing skills are playing a role in his/her struggles with reading and/or attention. Children in higher grades are forced to deal with smaller print for longer periods of time, so they visually break down more quickly. Third and fourth grade tend to be the years that many of these vision problems first start to become noticeable. 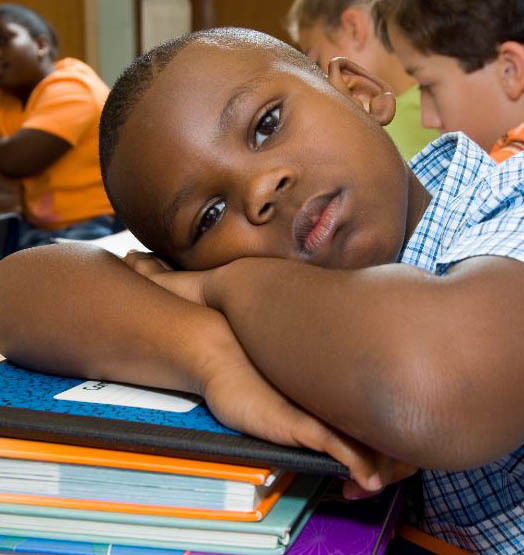 A child who does well in the first grade may find school performance slipping by the third. However, keep in mind that every child is different. The greater the vision problem, the sooner the child will falter. Also, some children are more sensitive to visual discomfort than others and may show symptoms earlier. Likewise, bright children sometimes find ways to make adaptations and cope and may not show symptoms until later. If your child scored poorly on the risk assessment, you may want to consider making an appointment with your eye doctor or finding a developmental optometrist in your area who specializes in the diagnosis and treatment of vision-based learning problems. While the above symptoms survey has proven to be a very reliable predictor of problems, the only way to know for certain is an evaluation by a professional. Contact the College of Optometrists in Vision Development at covd.org to locate a developmental optometrist in your area. Also, it should also be noted that children who struggle in school may have other developmental delays in addition to vision. 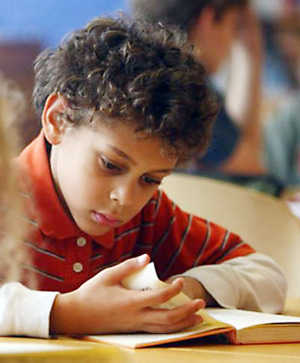 Reading problems can be caused by multiple factors, including central language processing deficits. In this case, the problem is not necessarily expressive language like clear speech, but receptive language such as the way the language centers in the brain interpret written text. These type of delays in language skills can cause true learning disabilities and arise from an inability of the brain’s language centers to efficiently decode and process print and/or make sound-symbol connections. Children who struggle with phonological awareness, or being able to identify the component sounds within words, are also at risk for reading problems. Unfortunately, children who have developmental delays in one area are prone to have developmental delays in other areas as well. Children who struggle with both vision and language face double deficits, and their reading problems tend to be profound. When we eliminate the visual concerns, however, we are removing half the child’s burden. While they may still experience problems with reading, the problems will be less severe. *Gerchak, David, Maples, WC, Hoenes, Richard. Test Retest Reliability of the COVD-QOL Short Form on Elementary School Children. Journal of Behavioral Optometry Vol 17 2006; 65-70.